This is my wedding dress. It’s based on a 1931 pattern which I was given. 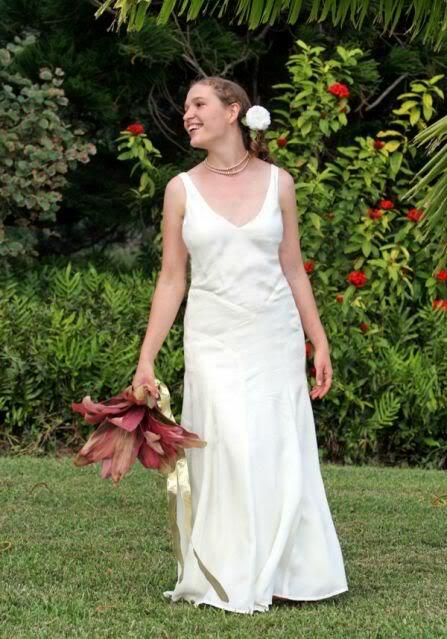 Mr Dreamy and I got married in Hawaii in 2005, so I needed a dress which was not too hot, and easy to dance in. I wasn’t happy with the dress as it was in 2005 . Well, more accurately, I went a little mad after the wedding and pulled it apart, and then regretted the pulling apart, but had changed it too much to put it back together, so in 2010 I finally re-cut a new bodice from my last scraps of fabric and put it back together in a way that I actually like. Stonewashed white silk charmeuse, purchased in the New York fabric district.